Pasco County officials say an 80-foot-by 10-foot (24-meter-by-3-meter)-wide section of the sinkhole's banks collapsed overnight Friday. Crews are now working to stabilize the bank of the sinkhole so debris removal can resume, deputies said. The edges of the sinkhole started caving in because there was no support for the sandy soil as it started to dry out, officials said last month. Emergency Management Director Kevin Guthrie said visible foundation cracks and buckling floors at the two homes on Ocean Pines Drive prompted the decision. A third home that's close to the sinkhole is at risk of being condemned. 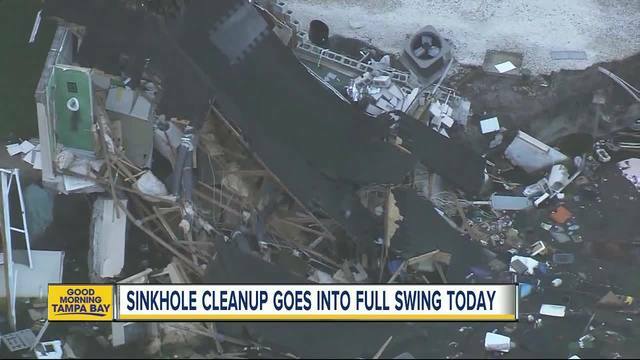 Pasco County authorities have canceled Friday's scheduled cleanup effort at the site of a Land O'Lakes sinkhole after a section along the side of the sinkhole collapsed overnight, officials said. Cleanup was expected to begin on Friday but had to be postponed after the banks collapsed. County officials say they believe it's caused by debris that sunk to the bottom and plugged a hole. If that's successful, crews could start trying to remove debris as early as Sunday.